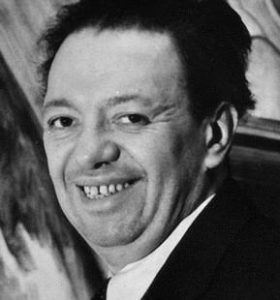 Diego Rivera, one of the pioneers of Mexican muralism was famed for his lifelike frescoes and vibrant paintings. He was passionate about painting since childhood and began pursuing art in Mexico’s Academy of San Carlos when he was barely ten. He migrated to Europe in the year 1907, and Teodoro A. Dehesa Méndez, the governor of the Mexican state of Veracruz, sponsored his studies there. He initially remained in Spain and gradually moved to France where he had the privilege of living and working with a host of eminent personalities. 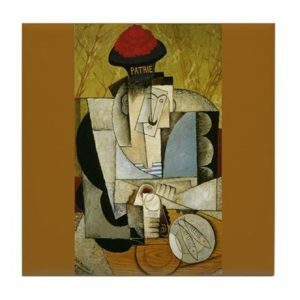 It was in Paris that he had come across the Cubism movement led by noteworthy artists like Georges Braque, Pablo Picasso, and Juan Gris. He embraced this new art form in between 1913 and 1917 after which his focus shifted to Post-Impressionism on being inspired by Paul Cezanne. 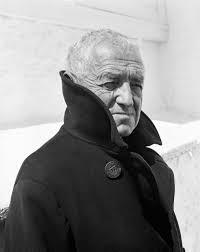 His artistic genius was appreciated worldwide and was put up in different exhibitions all over. His paintings were spontaneous as he had said “I paint what I see,” “I paint what I paint” and “ I paint what I think.” He married several times, one of his wives being the famous Mexican artist Frida Kahlo with whom he solemnized nuptial ties in 1929. Their wedding went through a lot of turbulence, and after getting divorced in 1939, they remarried each other in 1940, remaining a couple til Frida’s death. 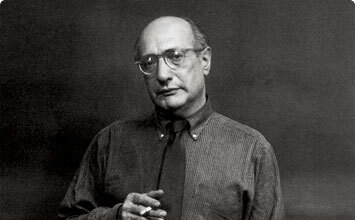 Rivera died at the age of 70 because of heart failure. One of Rivera’s popular landscape paintings, the use of vibrant colors especially while depicting the trees, transcends this work to a different level altogether. 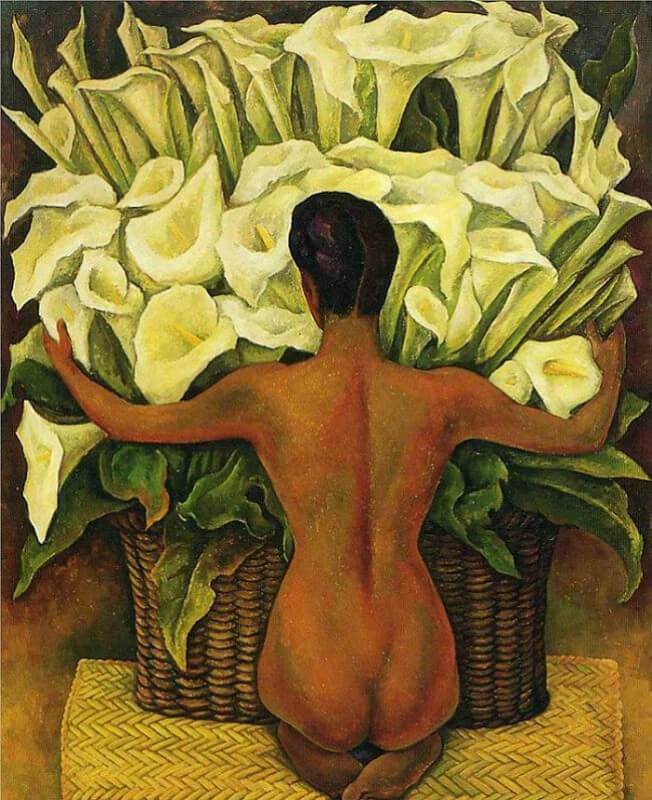 Alternatively named as Desnudo con alcatraces, it is one of Diego Rivera’s popular mural paintings, where he goes on to celebrate the peasants’ relationship with nature. The lilies which stand for sensuality has been magnificently depicted in this artwork. The Day of the Dead is one of the significant festivities of Mexico where people remember their loved ones who have transcended into the other world. 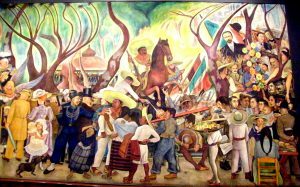 Rivera was a part of the Mexican Muralist Movement, and on his return to Mexico in 1921, he decided to create lifelike frescoes dedicated to the country’s festivities, this artwork being one of them. This fresco that hints at a kind of celebration was instrumental in setting the trend of including the Day of the Dead as a significant subject in visual arts. There have been a lot of controversies regarding this painting that had at first been set up at 30 Rockefeller Plaza’s lobby. It had initially gained the Rockefeller family’s approval, but controversies stemmed in after Vladimir Lenin’s portrait alongside a May Day parade had been incorporated. 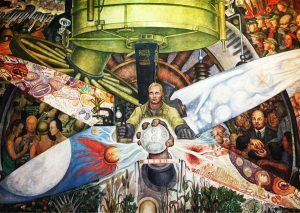 The then director of the Rockefeller Center, Nelson Rockefeller requested Rivera to remove the image, but the latter refused to so. Hence it was taken off and another mural by Josep Maria Sert replaced it after three years. 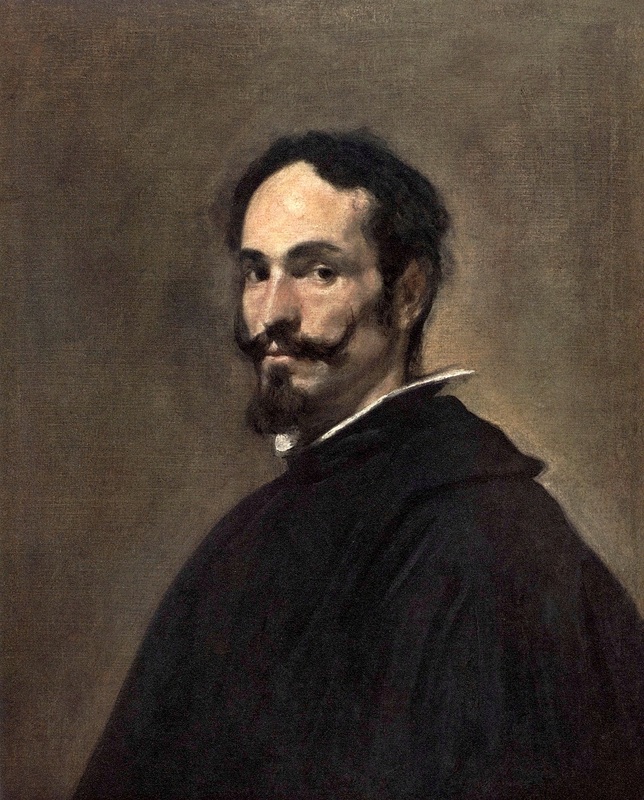 The original work only existed in the form of black and white pictures, following which he repainted this work, naming it Man Controller of the Universe, which was similar to the original barring a few changes. Watermelons have a symbolic meaning in the Mexican festival the Day of the Dead, used for commemorating the deceased. 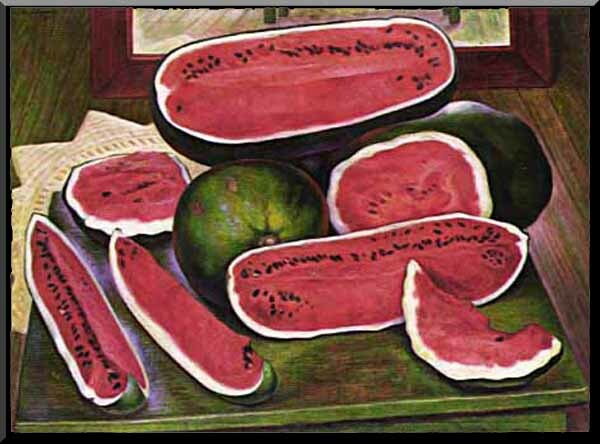 Diego Rivera’s wife had presented a still life painting of this fruit just eight days before her death. 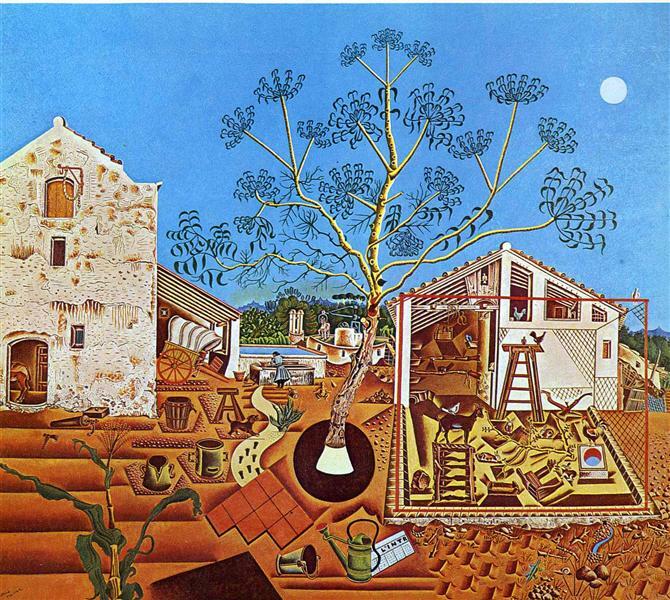 Rivera had perhaps made this painting in memory of his better half and coincidentally died a few days after that. 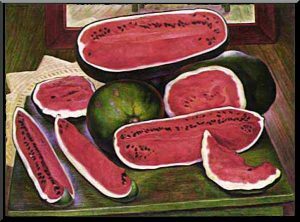 Though the significance of the watermelon is unclear the bright use of colors gives it a lifelike appearance. 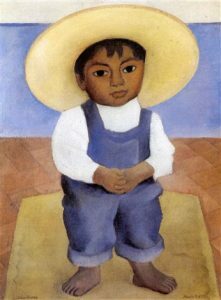 This lovely work of art perfectly exemplifies Rivera’s trait of painting people that he saw regularly. It is simple yet elegant, and the usage of colors is minimum. There is innocence on the face of the little boy as he stares contentedly. The gesture he forms by clasping his hands and the mature look in his eyes suggests him to be matured than his age. The big hat almost shields his face while his outfit indicates that he may be out to join his parents in the field. Through this painting, Rivera’s inclination to portray the lives of peasants and their struggle for survival has been reflected. Rivera was a part of the avant-garde movement of Cubism, that reflected in many of his works, this being one among them. 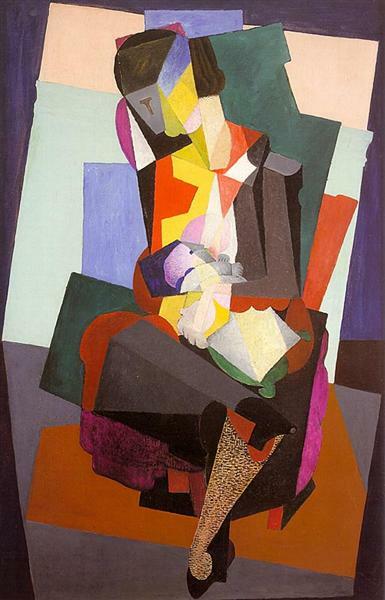 The Cubism technique of analyzing objects, breaking them up and abstractly reassembling them is seen in this painting. Based on Rivera’s personal life, the painting shows his common-law wife Angelina Beloff and their son Diego who left the mortal world in months post his birth after being afflicted with influenza. 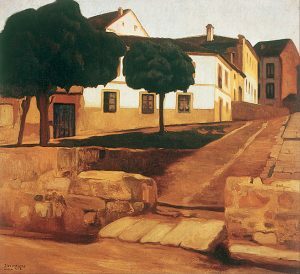 Carlos Obregón Santacilia, a famous Mexican architect, had requested Rivera to paint this picture for Hotel Del Prado’s Versailles Restaurant. 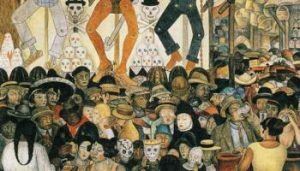 However, after the 1985 earthquake that plagued the city of Mexico, the hotel was demolished, and the mural was kept at Museo Mural Diego Rivera. 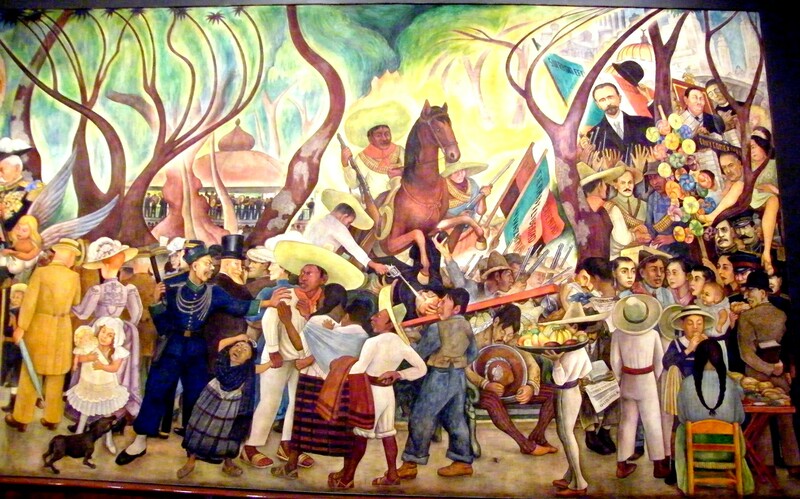 The subject matter of the painting is the conflict amongst the bourgeoisie class after the 1910 Mexican Revolution. He takes the Alameda Central Park as the main background against which a host of eminent personalities like his wife Frida Kahlo, La Malinche, José Martí and Winfield Scott have been featured. It is simple in appearance, but carries a lot of symbolism, depicting the turmoil and hassles in the life of the peasant class, a common subject seen in many of his works. 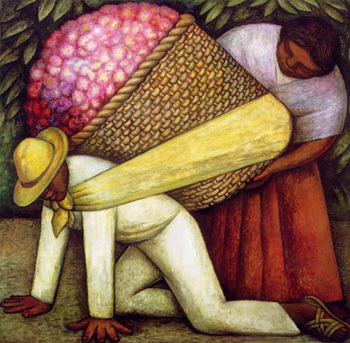 The peasant man is seen struggling to manage an oversized flower basket, with his wife helping him in the task. The flowers are marvelous, but the man carrying them is unable to cherish their beauty as to him it is just a mundane object of transaction. According to certain critics, the large basket burdened on the worker’s back may hint at the hindrance an untrained laborer may face in the capitalistic world. 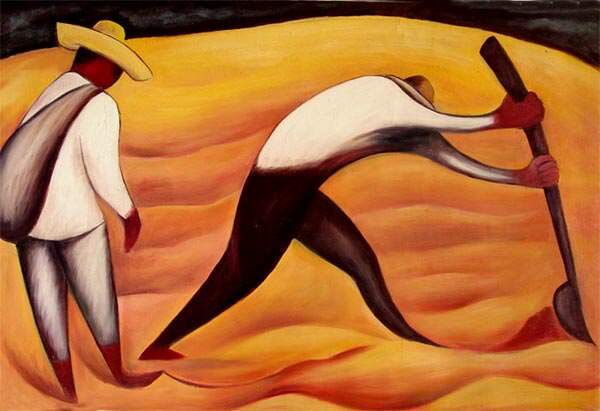 Another interesting peasant painting of Rivera where the man is seen toiling hard while another person looks on. The beauteous landscape created through the vibrant use of colors is a sharp contrast against the man in the frame who is putting in all efforts to complete the task. Another of Rivera’s Cubist painting symbolizes the increasing wave of the French nationalistic movement. Following the Cubism technique, he makes a geometricized version of the sailor who is seen seated at a wooden café table, indulged in a drink. The word “patrie” inscribed on his uniform is a hint of loyalty and patriotism. Founded by the Aztecs, this had turned into a flourishing city and Rivera makes a remarkable presentation of the marketplace scene through this painting. 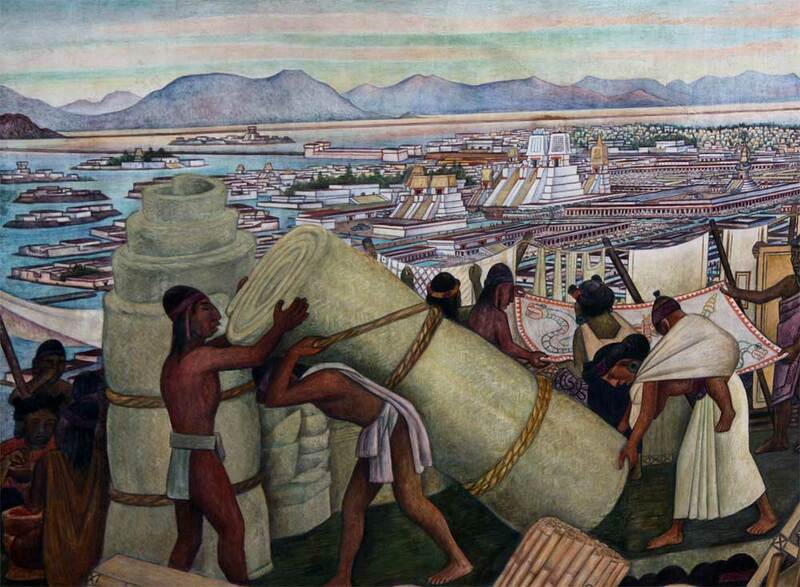 The work shows laborers toiling hard but does not hint at the imperialism of the Aztecs. Slavery was at its peak that time and men were sold like other commodities, though there is no hint of the same here. 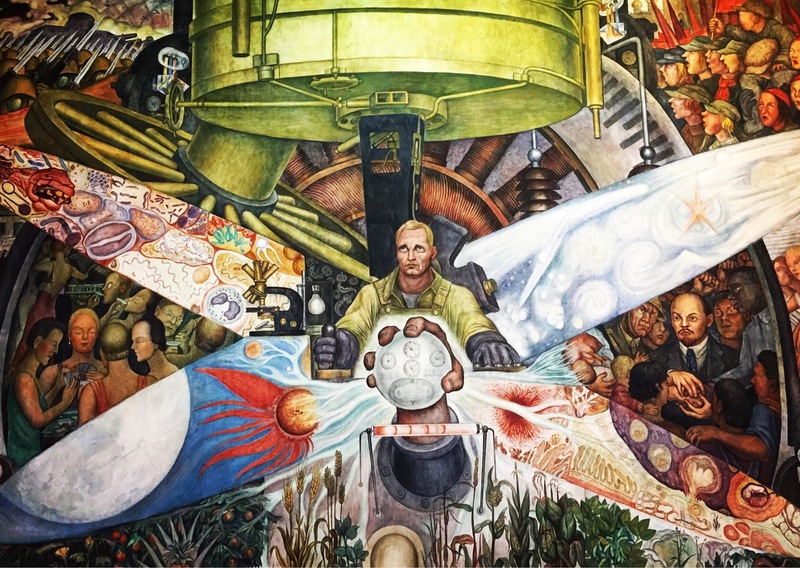 Other prominent paintings of Rivera include Avila Morning (1908), Sunflowers, Detroit Industry Murals (1932-33, comprising of 27 panels), The History of Mexico (1929-35, located on the stairwell of Mexico City’s National Palace), Sunflowers, and the House on the Bridge. Rivera has been the subject of several cinematic (Cradle Will Rock and Frida) and literary presentations. His wife Frida Kahlo had also projected him in one of her paintings in 1931 two years post their marriage, which was also regarded as their wedding portrait.